Ms. Amy's Montessorians | It's okay to not know, but it's not okay to not try. It's okay to not know, but it's not okay to not try. 5th Grade Maturation is tomorrow, Tuesday from 10:00 – 11:30 a.m. If you plan on coming to this meeting with your child please sit by your child. If your child has any questions you will be close by to answer them. It also helps with the giggling. The students giggle a lot during the presentation. If a parent is close by to help them feel more comfortable it makes it easier on the child. 5th grade parents are all invited. UT state standardized assessments (now called RISE and Aspire Plus) will be on the follwing days for our class. These assessments are important to us for several reasons. Because this is a group project, I will be offering time in class to work on this project. Students are welcome to take their packet home and do the research for their country at home. Students will be sent home with their packets and country assignments tomorrow, but they have not had a chance yet to meet with their groups and plan out division of labor. We have had a problem with the noise level in our classroom for quite some time. Yesterday we had a class meeting and discussed different options to help our class work during work cycle and talk during recess and lunch. The students voted and decided to implement the following new procedures. The students are expected to complete 6 challenging works during morning work cycle. Prior to lunch they need to show Ms. Amy their work charts with all 6 challenging works checked off. Ms Susan checks off work throughout work cycle. The students who talk or disrupt other students during work cycle will have a silent lunch with Ms. Amy in the hallway. There were 5 students who had a silent lunch with Ms. Amy in the hall today. They exhibited one or more of the behaviors mentioned above during work cycle. The students all agreed they should set a good example for the other students and follow our CHAMPS rules. I have attached a copy of our CHAMPS for your reference. Every morning I write the word LEARN up on the board. If the class is noisy I erase a letter. If they are quiet I add a letter. This is a silent way for me to let the class know their noise level is too high. If the students earn four extra N’s (LEARNNNNN) then they can have 5-10 minutes of extra recess. The children also earn points on our classroom thermometer. When the thermometer gets to the top the children earn an extra privilege. They are currently working toward a Dr. Seuss party. This party was scheduled for earlier this month but the students were being disrespectful so they lost the party. This months book reports original due date was today, but there are many students who need a few more days. I will extend the due date to Tuesday March 19th. Please encourage your children to get it turned in on Tuesday so they don’t loose points for this home project. We have talked extensively about the expectations for this project in class. Many students have already presented and they have done a wonderful job. I wish I could post pictures of their great project. We had a wonderful diorama turned in yesterday for a book report. I love to see the students creativity and enthusiasm for reading. The children are expected to present their book report to the class, include a creative element (power point, puppet show, lego scene, diorama etc.) and turn in a written report. The children are expected to include everything on the rubric in their written report and their presentation to the class. The rubric was sent home with the children a few weeks ago and there are rubrics available in the classroom at all times. I have attached a rubric here for your convenience. Please make sure your child brings a healthy lunch to school with them each day. There are a few students who regularly don’t bring a lunch to school at all, and others who bring unhealthy food. In order for a child to function all day long and to learn all the things they need to learn they need fuel for their bodies and their brain. Please talk to your children about bringing a healthy lunch and eating it. If your child doesn’t bring a lunch as a natural consequence for not preparing it, please let me know. It’s important they eat, but it’s also important they learn responsibility. Thank you, if you have any questions please let me know. This week is Literacy Week! A beautiful tree has been put up on the wall in the front of the school. Each time a student reads a book, they get to add a leaf to the tree. Please encourage your children to spend time at home reading good books! We want our tree to sprout a lot of leaves! Each of the students should be coming to school this week with a printed picture of the cover of their favorite book, along with a brief summary and what they liked about the book. If printing a picture is not an option for your family, the student may draw a picture of the cover instead. On Tuesday we will have an assembly with a local author named Julie Lee. She shares a message of self-acceptance and mindfulness that I am excited to hear! Tuesday night is also Literacy Night. Please come with your family and enjoy fun games and activities, as well as an Usborne book fair. It is at the school from 5:30-7:00 PM. 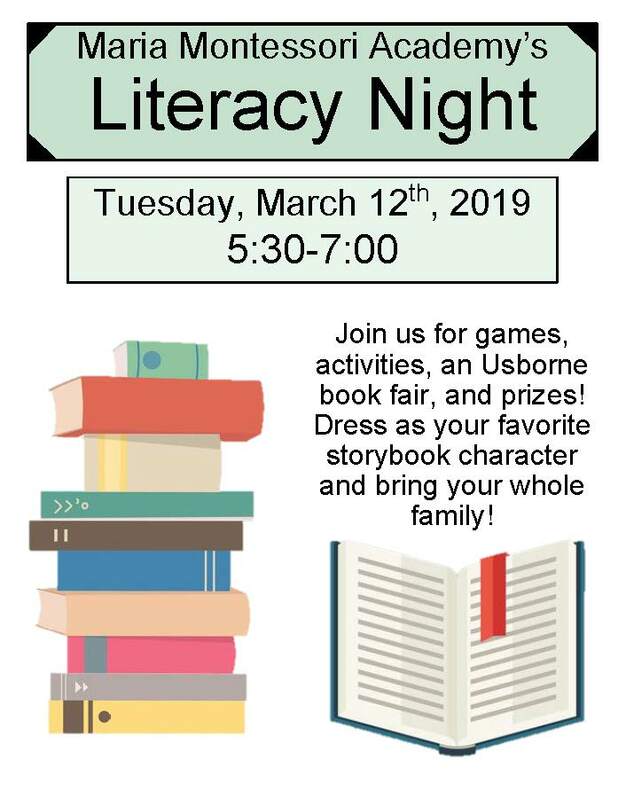 Come dressed as your favorite storybook character and have fun celebrating literacy with us! Friday we will have a read-a-thon from 10-11:00 AM. They should bring a book from home if we do not have a book in the classroom that they want to read. Friday is also an early out day. School will dismiss at 1:00 PM. We are still in need of page protectors. The students use page protectors in their portfolios. We went through about 150 of them prior to P.T.C. Entries and Comments. 46 queries. 0.272 seconds.